1948 London Motor Show was the tipping point in Jaguar history. It marks the birth of Jaguar XK120 sports car and one of the most iconic powerplants in motoring history, the XK engine. This model was the first for the marque, as company's name was changed from SS Cars to Jaguar in 1945. Decision was made after World War II, because letters SS had Nazi connotations. 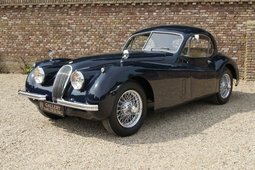 Two-seater XK120 was originally intended as a test and show model for the new 3.4-litre 160 bhp six-cylinder engine, but not for the production. According to brand’s founder William Lyons vision, saloons was the future for Jaguar company. At that time, he decided that a saloon, powered by a race car engine, will appeal to customers. 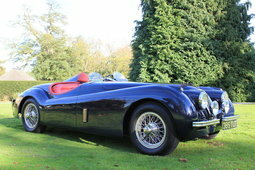 That’s why W. Lyons didn’t believe in XK’s success and only a few examples were due to be built. However, when it was launched at the London Motor Show in 1948, its smooth, calm and powerful design caused a sensation. Everybody fell in love with the wing line, which resemble a rolling wave – it starts from the front wheels, over the hood, and continue to the rear. Newborn gave so much interest that Jaguar put it into production. 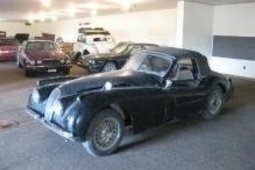 British started with alloy-bodied Jaguar XK120 roadster. Aluminum was considered as flimsy material and conventional method for making cars at that time was steel. 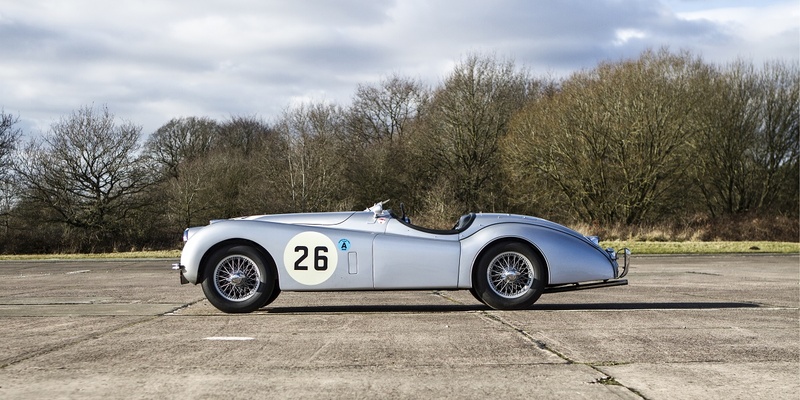 Jaguar produced just 242 of them until aluminum version was replaced by steel-bodied roadster in 1950. Today the rare alloy bodied roadsters are most valuable among all XKs and cost around $220,000-300,000. In 1951 was introduced a “fixed-head” coupe and a drop-head coupe in 1953. These two open versions were generally more luxurious than the roadster – they had wind-up windows and wooden veneers on the dashboard and doors. Another interesting feature for all XKs were sleek doors with no external handles. Nevertheless, its buyers were admired that at a bargain price of less than £1,000 it gave high performance levels. At that time XK120 was the fastest standard production car in the world and its designation '120' refers to '120 miles per hour' (193 km/h) – an incredible speed in an era when most serial models could manage about half this. It was real hit from the beginning, especially in the United States. 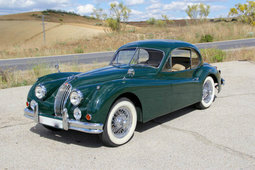 Among the first XK120's lovers were Hollywood stars like Clark Gable and Lauren Bacall, and it gave more popularity. XK engine became one of the best known Jaguar's feature for the next decades. It was light, powerful and reliable motor, which remained basically unchanged for almost 40 years. The unit was used also in E-type, which was launched in 1961, some sports car and several saloons. Jaguar dominated Le Mans 24-hour race in the 1950's, winning it five times with C-types and D-types racing cars and all of them were using XK120 engine. Even racing star Stirling Moss praised the 3.4-liter XK engine for its “nice, smooth power” and “lovely noise”. 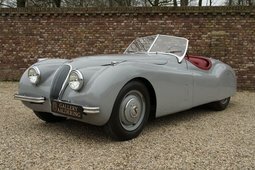 As production of the XK120 stopped in 1954, it was changed by XK140 (1954-1957) and later XK150 (1957-1961). 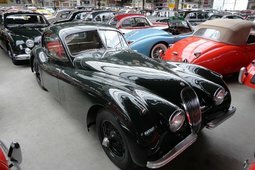 Better-developed XK140 had more powerful engine and other improvements included uprated brakes and suspension, while XK150 was radically revised – coupés got minimal rear seats and new taller doors, which was fitted with high-silled wind-up windows and the wing line no longer dropped so deeply. Jaguar made 12,078 XK120s from 1948 to 1954, 8,950 XK140s and 9,396 XK150s. Average price for the XK is about $120,000 today. 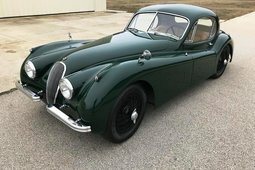 Certainly there are many models with a twice bigger or lower price tag, as exceptions like 1953 Jaguar XK 120C, which was sold for $8,091,216 at the Bonhams auction in Monaco in 2016. After all, such figures are not bad for a car that was never meant to reach any roads. No doubts it was one of the most beautiful and memorable sports cars of all time.